Dole Packaged Foods, notorious for its award-winning Tournament of Roses Parade entries, and the record-holder for most Sweepstakes Trophy wins, announced today its Hawaiian design inspiration for its 2017 float “Spirit of Hawaii” and kicked off the road to the Rose Parade with its Spirit of Hawaii Sweepstakes and Spirit of Giving partnerships with FOOD Share. Throughout its participation in the Rose Parade, Dole has showcased various countries and cultures where DOLE fruit is grown. Dole Packaged Foods is committed to providing convenient, healthy, non-GMO products to help people live long and healthy lives, as well as using sustainable, environmentally friendly, healthy and safe ways to produce its products to conserve Earth’s most previous natural resources for generations to come. The 2017 float features fresh, non-GMO fruits and vegetables grown by DOLE, including bananas, pineapples and mangoes. Along with the ‘Spirit of Hawaii,’ Dole Packaged Foods is participating in the ‘Spirit of Giving,’ and will be collecting non-perishable food items as part of its participation at the annual “Live on Green” event in Pasadena Dec. 30 – Jan. 1, as well as at Fiesta Floats and its headquarters in Westlake Village, Calif. to benefit FOOD Share, part of Feeding America, and its partners throughout the San Gabriel Valley. 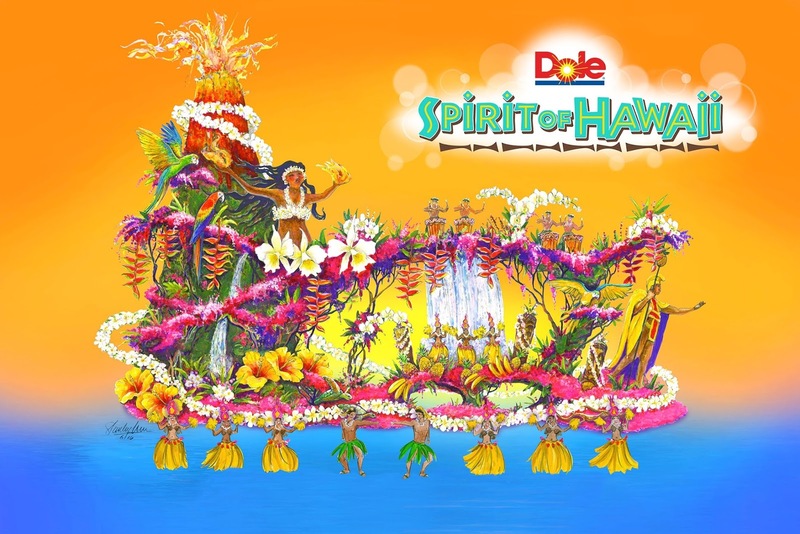 Dole has selected FOOD Share President and CEO Bonnie Atmore to ride on Dole Packaged Food’s Rose Parade float in honor of her commitment to feeding, nourishing and educating the hungry. To kick off the final road to the 2017 Rose Parade, Dole Packaged Foods is launching a sweepstakes, in which one lucky winner and a guest will get to travel to the Big Island of Hawaii. Running through to midnight on December 31, 2016, fans can enter for a chance to win the grand prize vacation, including hotel and airfare, as well as other weekly prizes. For more information about the sweepstakes,and to enter, visit Facebook.com/DoleSunshineor DoleSunshine.com/paradise. Dole Packaged Foods LLC is a world leader in growing, sourcing, distributing and marketing fruit and healthy snacks. Dole sells a full-line of packaged ambient fruit, frozen fruit, dried fruit, and juices. The company focuses on four pillars of sustainability in all of its operations: water management, carbon footprint, soil conservation and packaging. For more information please visit www.dolesunshine.com orwww.doleintlcsr.com.